For Viktor Yanukovych it was supposed to be a moment of triumph. On 1 July Ukraine's president hosts the final of the Euro 2012 football championship in Kiev's impressively refurbished Olympic stadium. A special presidential "lodge" has been constructed for VIPs, with 54 seats reserved for European dignitaries and heads of state. The pitch is already perfect. All it lacks are the goalposts. But Yanukovych is likely to watch the final sitting on his own: over the past week EU leaders – led by the German chancellor, Angela Merkel – have threatened to boycott next month's event in protest at the persecution of the jailed opposition leader Yulia Tymoshenko, who was beaten in prison and is now on hunger strike. Not everyone in Kiev is convinced the EU leaders will stay away. "I'm not bothered. I don't think there will be a boycott," said one resident, Konstantin. His football stall was busy selling Euro 2012 Poland-Ukraine T-shirts for 100 Ukrainian Hyrvnia (£8), as well as blue FC Kiev Dynamo scarves. "Business is OK. We've had a few fans already," he said. At the stadium a group of tourists were peering at the new membrane-covered roof. The 70,050-seater sporting arena was rebuilt to Uefa specifications at a cost of $580m. As well as the VIP lodge, the complex has been fitted with new changing rooms, lifts that work even if the power fails, and seats painted in patriotic Ukrainian colours, a glorious oval of yellow and blue. In the stadium's museum are the two Uefa Cup Winners cups won by Dynamo Kiev, in 1975 and 1986. There are also photos of the country's footballing heroes: the grumpy legendary manager Valeriy Lobanovskyi; national coach Oleh Blokhin; and former Chelsea player Andriy Shevchenko. One wall is plastered with black and white mugshots of Soviet-era teams. Next to the entrance, work was today still going on: bulldozers demolishing the remnants of a shopping centre. For President Yanukovych, Euro 2012 was a unique opportunity to sell Ukraine to the world: as a modern, peaceful, pluralistic, EU-aspiring nation, with a rich history and culture. Instead, his government is now staring at a PR disaster. Yanukoyvch's critics say the west has belatedly woken up to the ugly things happening in Ukraine since 2010. It was Yanukovych whose attempts to cheat during the country's 2004 presidential election sparked the Orange Revolution. The eventual winner of the election was the pro-western Viktor Yushchenko. Tymoshenko was his Orange ally and became prime minister, but the two found it impossible to work together, and in late 2005 Yushchenko sacked Tymoshenko and her entire cabinet, and made a deal with Yanukovych. She came back as prime minister two years later, but the Orange Revolution was to end in failure and recrimination, with its two main protagonists – the history-fixated Yushchenko and the populist Tymoshenko – locked in a debilitating struggle. International observers agree that Yanukovych won the 2010 poll fairly, amid voter disillusionment. But since then, his critics say, he has embarked on a surprisingly rapid programme of de-democratisation: centralising power, subverting the constitution, and selectively prosecuting his political enemies. Ukraine's once vigorous media has become less free. State TV now uses the same wooden Soviet formula as Putin's Russia: with Yanukovych shown seated solemnly across a desk from his prime minister. EU diplomats say that in many respects Ukraine's problems are little different from those of other post-Soviet states. But what incenses Brussels is Yanukovych's extraordinary personal attack on Tymoshenko, who was jailed for seven years for abuse of office. Observers say the court case against her was a politically motivated – its aim to remove her from the game ahead of elections to the Rada, Ukraine's parliament, this autumn, and the next 2015 presidential poll. Tomas Valasek, the director of foreign policy at the Centre for European Reform puts it like this: "When one sees that five former ministers of the previous government are in jail, but people who are certainly equally corrupt or who are closer to the current government are not being persecuted, I'm sorry, that's not justice, that's vengeance. That's the EU's main problem," he told Kiev's Day newspaper. Kiev has pursued what it calls a "multi-vector" foreign policy: in effect, playing Moscow and Brussels off against each other. The Kremlin wants Ukraine to join a customs union; Yanukovych has so far resisted. But the Euro 2012 fiasco leaves him isolated and weak, forced to look eastwards rather than westwards. Olexiy Haran, one of Ukraine's top political scientists, says that someone appears to have persuaded Yanukovych that putting Tymoshenko in jail was a good idea: "From a psychological point of view he has a desire for revenge. 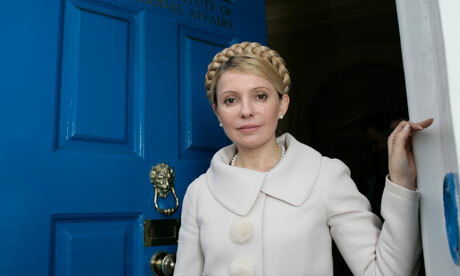 Yanukovych also fears Tymoshenko. And he wants to show he is master in the country." "Someone has played his feelings very well," he said. Who might that be? He answered: "Russia's security services. Or Russian lobbyists close to Yanukovych." Haran went on: "Yanukovych is inexperienced in international relations. He doesn't understand how the EU works." Ukraine's president might still be persuaded to release Tymoshenko and allow her to travel to Germany for medical treatment, he said. But he added: "From a rational point of view he needs to restore relations with the EU. But it is difficult now for him to back down." It's also too late to move Ukraine's matches to Germany, a scenario some German politicians have fancifully suggested. A dome in Kiev's Maidan Nezalezhnosti – the scene of Ukraine's 2004 tent revolution – has already been transformed into a large football; just down the road along Khreshatik, the capital's languid main avenue, a digital clock counts down the 36 days to kick off. Ukraine's government has responded slowly to the crisis, which worsened this week after photos emerged of Tymoshenko covered in bruises. On Wednesday her daughter Eugenia said prison guards had punched her in the arms and stomach. Ukrainian prosecutors claim she injured herself. President Yanukovych has so far said nothing. Speaking earlier this week Oleg Voloshin, the foreign ministry spokesman, accused the Germans of adopting "cold war tactics". "Our position is very simple. Euro 2012 is about football not politics. It's impossible to solve any political issues through boycotting sporting events," he said. Speaking on Thursday, Vladimir Putin – who returns as president next week – echoed this sentiment. "I think that under no circumstances should one mix politics, business and other issues with sports," Putin said, according to Itar-Tass news agency. Ultimately, though, the row isn't about football but Ukraine's geopolitical destiny. Do its current rulers want to adopt European values? Or is the aim of Yanukovych, an old-school apparatchik hewn from tough Soviet clay, to create his own mini-version of Putinism? The second option is more tricky than it might seem, given that Ukraine is currently in the grip of a major economic crisis, lacks Russia's abundant oil and gas reserves, and is painfully dependent on foreign loans. It is also a question about identity. Are Ukrainians central Europeans, like the Poles, or more closely aligned with Russians? According to Haran, Ukraine was still doing pretty well, especially if you compared it with its dismal eastern neighbours. There was a lot to be proud of, he said. "We are a democratic country compared to other post-Soviet states. We have no inter-ethnic conflicts. And we're the birthplace of Christianity in this part of the world." • This article was amended on 4 May 2012. The original referred to elections to the Duma in Ukraine this autumn. This has been changed to the Rada – the correct name for Ukraine's parliament.